Aside from all the mushy-gushy things, planning a wedding requires you to be thorough, organized, and practical. You need to go through a lot of processes even just for making the menu like establishing a budget solely for the food and drinks, picking the right caterer or vendor, choosing dishes that are safe for people with allergies and considerate to people on certain diets, and so on. 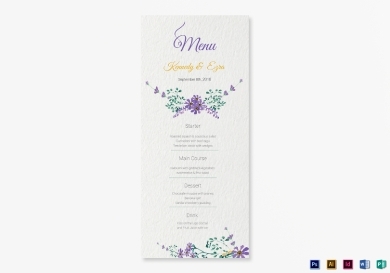 Aside from that, you also need to pick out the stationery for your menu card, what design and layout to use, etc. 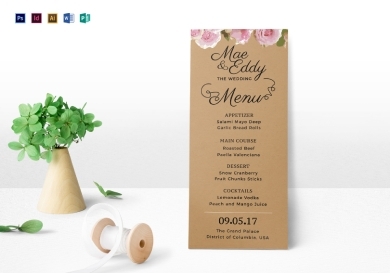 Lucky for you we have here some of the best wedding menu templates that you can download and easily edit. Choosing a simple and basic theme for a wedding helps you save more money since you don’t have to go over-the-top with the decorations and materials for the wedding. If you want to go for that, you should go for a simple rustic theme that gives off an easy countryside vibe. To match the theme, you can download this rustic wedding menu template to list down the dishes you will be serving during your wedding reception. Having a wedding during the fall season will always give you that dreamlike feeling—leaves falling from the trees, good weather, minimal flower decorations, and well-dressed guests will make anyone feel giddy. 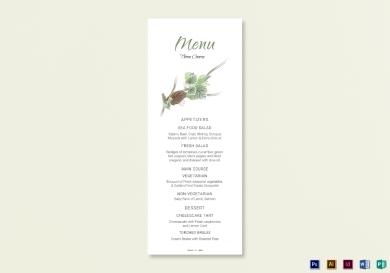 If you are planning to have your wedding during fall and you’re looking for the perfect menu template that will suit the vibe, this one is perfect for you. This fall wedding menu card template features minimal flower designs, a flexible layout, and unique fonts that you can easily customize to incorporate your preferences. Picture this: walking down an aisle with grass as the carpet, a venue filled with flowers, and with birds chirping in the background. Then, a well-decorated aisle with natural sunlight as the spotlight. Ah, who doesn’t love a garden wedding? But aside from the decorations, you need to make sure all your materials are consistent with the flowery and natural vibes of your theme. This garden wedding menu template features dainty flower designs, lively colors, and dainty font styles. You can download this template, and change the colors and layout if needed. Every girl has dreamed of having a beach wedding their entire lives, but sometimes, things aren’t just meant to be. But there’s no need to be sad, you can still go for a beach-themed wedding if you’d like. 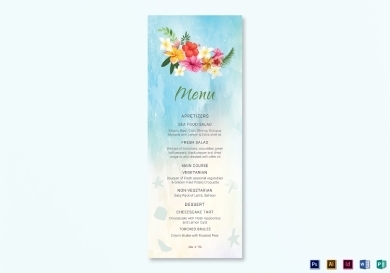 Let your guests know your love for the beach with this beach wedding menu card template with high-quality designs, original artworks, and structured layout. You can easily tweak this template to personalize it and incorporate your own style. You can edit this in Adobe Illustrator, InDesign and Photoshop, and MS Word and Publisher. When you want a vintage theme for any event you immediately think about the classy silhouette of past generations, the dainty designs, and intricate patterns. The past has such a rich culture that you can take inspiration from when you decide to go for a vintage theme for your wedding. 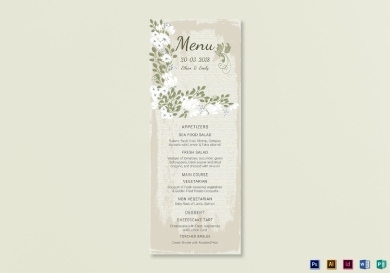 With that in mind, you need to have a menu card that sticks to the classy vintage vibe. You can download and use this vintage wedding menu card template to make use of its creative illustrations and layout. It is quite common for couples to use a nautical theme for their wedding especially when one is employed in a nautical-related job. Although the theme already has its established colors—white, blue and red—you can totally use others especially when those colors do not spark joy for you. 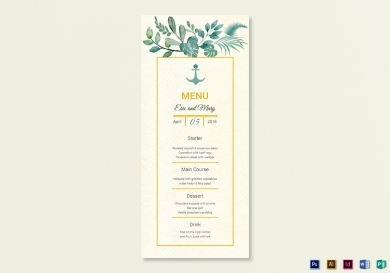 This nautical wedding menu card template, for example, has a rustic vibe with flowers, leaves, and bright borders, but still uses the image of an anchor as a nautical element. You can download this template and easily edit the designs, text, and layout of this template as you see fit. 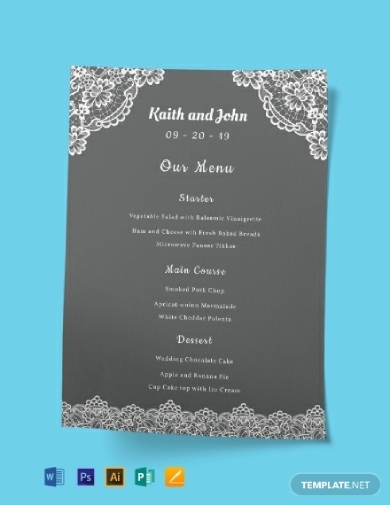 It is quite common and trendy nowadays to use a chalkboard theme for the stationery of any event. Using that for your wedding menu will allow you to have a good background that will emphasize any text that will be written on it. 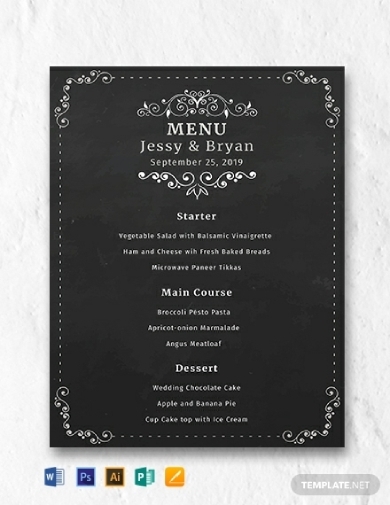 This chalkboard wedding menu template features a dark background that allows for the emphasis of the texts, especially with the white-colored font. This also has an intricate style for the border but with a simple layout that will surely impress your guests. Download this template for free from this article and edit as necessary. When you say elegance and class, lace immediately comes to mind. Same goes for when you use lace details on your wedding menu. It can surely help make your menu look glamorous that will leave your guests in awe. If you are looking for a unique lace wedding menu template we have the perfect one for you. When you download this template you can make use of its high-quality design, original illustrations, and flexible layout. This wedding menu template is printable and easily editable to incorporate your personal style and preference. Talk about glamorous! 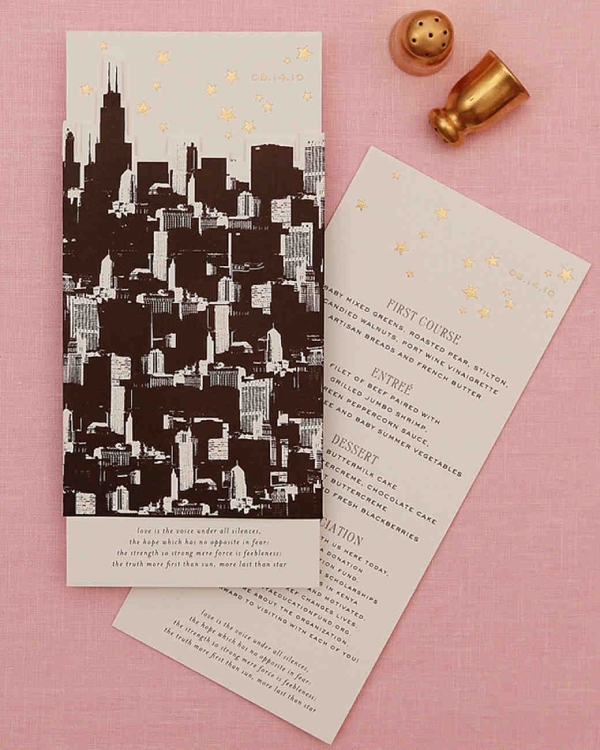 This wedding menu example features high-quality image and gold stars perfect for the old Hollywood fans. If you want a charming menu for your wedding as this one, you can take inspiration with how the designs are flawlessly incorporated and use this as a guide or basis when you start to design for yours. 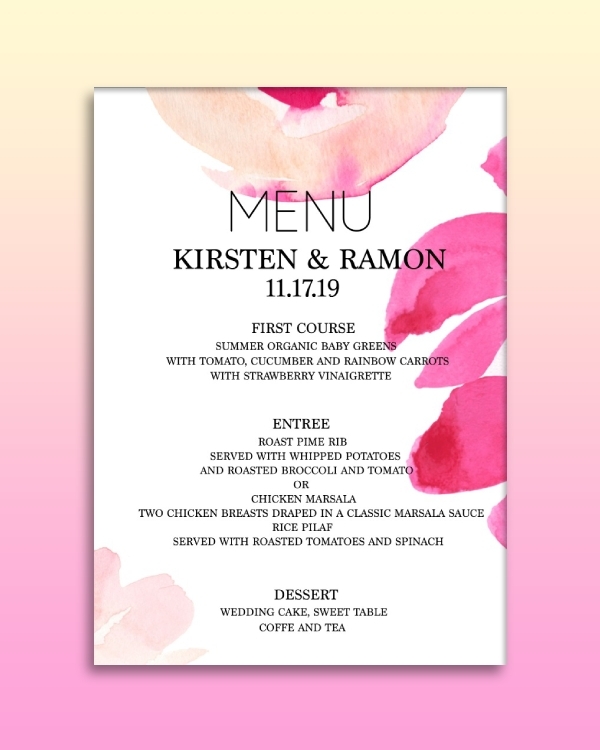 If you want a modern twist to your watercolor fantasies you can take inspiration from this wedding menu example. As you can see, it has a minimal watercolor streak as its main design element that adds a vibrant color to the overall appearance. The texts are also in a simple modern font style that ties the minimal but vibrant feels. If you want that for your wedding, you can use this as a basis when making your menu card.